Although a clearing can be done with an empty chair, it is most effective if it is done with the person I have the charge with. Let’s call that person my “Mirror”, because they are the target of my projections. And yes, virtually all clearings are about projection. Intention: What is my intention in this moment? Do I want to connect with this person right now? If not, best to take a time-out and wait until I do want to connect. Boundaries: Has this person violated a boundary with me? If so, I will need to let them know that the boundary violation has occurred and then perform the rest of the clearing process. When the clearing is completed, I will then have to set the boundary. Data, Judgments and Feelings: Parse the problem into its elements. Do data first then either judgments or feelings, whichever is stronger in this moment. Shadow: Who (or what) in my life does this judgment or feeling remind me of? 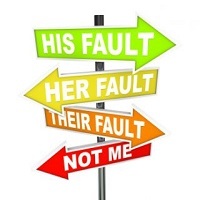 Ownership: Once I can connect my feelings and judgments with a past event, it is time for me to take ownership of both and remove my projection from the mirror. Wants: Going forward, what do I want for myself that has nothing to do with the mirror? This may be something like safety or self-respect, but it is important to make sure that I know what I want for (and from) myself. Relationship: Recognizing that I may or may not get what I want from the mirror, be clear about what I do want. For example, I may want deeper friendship, but the mirror may not. I can ask for what I want, but not expect to get it. Closure: How do we want to end this process? Most often, it ends with a hug. The clearing process is tricky. For years, I tried to get my wife to work the process with me, but that required that I take on two roles: participant and facilitator. I could never pull that off. When we went to a training by Bill Kauth and Zoe Alowan, they introduced their version of this process. Bill was going to ask us to break into dyads to practice, but I asked that each dyad have a facilitator and I asked that Zoe work with Donna and me. This was the breakthrough moment for us. Zoe’s presence made it safe enough for Donna to trust the process. She was able to get in touch with a childhood event that was still operating in the present moment and release the projection she had placed on me. The clearing process can be a wonderful healing tool, but it must have a skilled facilitator who is familiar with this process until both parties are well skilled in doing clearings. I cannot emphasize this enough: Don’t try to clear with a partner or a co-worker unless you first have explicit permission to do so AND you have a facilitator who understands this process and has experience using it.